This special issue invites scholars, as they look to the future, to highlight the most successful and promising strategies for designing, implementing, and assessing future faculty development initiatives. Authors have addressed the best practices implemented or in process on their campuses along with challenges or opportunities involved with engaging faculty through the use of technology. In the spirit of exploration, this paper discusses the what, why and how of unconferencing and explores its implications as a transformative approach to faculty development in higher education. The authors define an unconference faculty development experience as: a less-structured opportunity for participants to learn and grow by sharing individual expertise in a variety of ways that reflect participant interests, preferences, skill sets, and needs. This paper explores the distinctiveness of unconferencing as compared with traditional conference structures, presents a rationale and theoretical underpinnings of this practice, and suggests general guidelines that address some of the pragmatic and logistical issues that inform successful unconference events. Three cases are examined to contextualize the what, why and how of unconferencing as a dynamic and grassroots approach to envisioning faculty engagement and development. Traditional professional development related to teaching is offered on a short-term basis and at the individual level. Recent experiences and research studies have led to an organizational level model in which the educational developer forms a sustained partnership with administrators, faculty, staff, and students in a department, offering multiple teaching and learning interventions that support curricular and organizational change. This article describes the partnership as an insider’s approach and a new model for professional development related to teaching and learning. 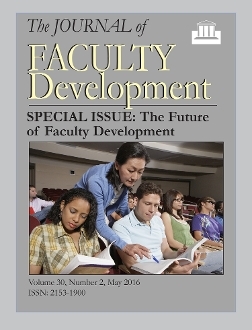 The future of faculty development rests, in part, on forming guided “communities of practice” to foster the Scholarship of Teaching and Learning (SoTL), which may enhance both scholarly productivity and pedagogical effectiveness. This article will discuss University of North Georgia’s SoTL Academy, which bridges geographic and scheduling distances through multimodal communications, using meetings, videoconferencing, and asynchronous online communication to form in-person and virtual communities. The SoTL Academy focuses on current SoTL research, project design methodologies, assessment practices, and publication opportunities. Flexible SoTL development programming supports faculty as they engage in research and respond to ongoing changes in higher education. Centers for teaching and learning (CTL) have traditionally relied upon on-campus programming to support faculty professional development, but as increasing numbers of faculty access resources and collaborate online, CTLs could do more to build online community. To meet this challenge, our team developed a website, EdTech Commons, which features faculty-generated content about teaching with technology. Through research from faculty development and education, along with descriptions of our process, an implementation timeline, and example site content, we argue that virtual faculty communities are the future of faculty development. The need for faculty development continues to increase despite the limited resources of many developers to serve growing demands. To address this conundrum, we explore existing literature about communities of practice (CoPs) in higher education and case studies of CoPs at our institution as an avenue to extend and supplement future professional development for faculty. The accompanying analysis leads us to propose that faculty developers should leverage faculty expertise using the communities of practice framework, distinct from faculty learning communities, in future faculty development. Assessment is a cyclical process within which educators construct outcomes, implement programs, assess constructs such as learning, evaluate results, and utilize results to craft stronger programs and services. Within educational and faculty development, assessment measures program impact on faculty, students, and/or institutional culture. Additionally, assessment activities support the scholarly dissemination of evidence-based and high-impact practices. Unfortunately, many centers of teaching and learning struggle to implement assessment practices that go beyond satisfaction-based program evaluations. This struggle can be attributable to multiple factors, including weak assessment infrastructure, shortsighted assessment goals, ill-conceived frameworks, and limited resources to do more than collect satisfaction data. We present an assessment framework that addresses these limitations by organizing center assessment efforts around faculty learning outcomes (FLOs). Building on previous studies on the changing nature of faculty work, this article presents a conceptual framework for faculty professional success. The authors report on the perceptions of 300 faculty development professionals regarding the importance of skills in nine competency domains: teaching; research; leadership; diversity, inclusion and multiculturalism; the ability to obtain external funding; work-life balance; internationalization; innovation; and the effective use of technology. They also explore how institutional characteristics are related to these perceptions. The article introduces a new lens—one of faculty competencies—through which individuals and institutions could chart programmatic direction and priorities. Members of the UWM CETL online and blended faculty development team share innovative technological and pedagogical strategies that they currently utilize to motivate and assist instructors in developing courses for the online or blended environments, and they discuss the lessons learned from incorporating active learning, open content, bring your own device, game-based learning, and multi-modal offerings into their programming. Additionally, future areas of technological and pedagogical innovation, which include credentialing and digital archives of effective teaching strategies, are examined. Finally, the authors provide a five-stage framework for developing an evaluation strategy for implementing innovative technology and pedagogy. How should educational developers develop their own expertise and skills in the twenty-first century? Today educational developers are drawing on new discoveries in educational research, supporting new pedagogies in many fields, and experimenting with new technologies for teaching and learning. Yet they must do so in a time of uncertain and sometimes uneasy change. This essay explores some of the implications of the era of innovation for educational developers and, in particular, the challenges it poses for our own professional development. It considers major contexts that will shape our work and identifies strategies for how we might prepare for the future.